After reading this article, the critical question to answer is who are the students who have not participated in a college visit for the duration of the grant. Using SCRIBE to track participation data makes it easy to identify students who have never participated in a college visit, so they can be targeted for upcoming college visits. 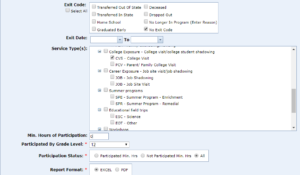 To pull a list of students who have not participated in a college visit (or any other service type), access the Student Participation By Grade Level Details (Service Type) report by going to Reports > Goals and Objectives Reports > Student Participation By Grade Level Details (Service Type). 1. Select “No Exit Code” in the Exit Code filter. 3. Select “12” for the Participated by Grade Level field. 4. Select “Excel” as the report format. The report will display a list of students and the total hours of participation in the specified services. The total hours reflects the sum of all hours across all years for which the grant has tracked data in SCRIBE. Once in Excel, turn on the filters and filter out students above the target threshold, which could be 0 hours. The resulting list displays all students with no participation in the specified service type. Get those students on a college campus!